A patio is one of the most important sections of your property. Why? Well, because it has both lifestyle and resale value. You can use it as a substitute for a living room during summer, thus making your guests feel more pleasant and saving money on your AC at the same time. On the other hand, when you decide to sell your place, you can get a much better price for a home that has a patio than a home without one. So, this needs to come at the very top during your next big home improvement project. These materials differ based on their cost, the complexity of the installation (which further adds to your overhead) the longevity (even though the least durable ones last for at least several decades) and the overall aesthetics (even though this is quite subjective). With that in mind and without further ado, here are five important patio building materials that you should use in order to get the most out of this project. We’ll start with the most expensive and carry on to somewhat more frugal options. When it comes to the overall elegance and durability it’s impossible to top stone. When it comes to the durability, stone pavers are simply second to none. Think about it, there are some stone floors that are virtually undamaged for millennia, although it is highly unlikely that your stone pavers will last as long. If properly maintained, however, these pavers can outlast a century which is, on its own an impressive feat, as well as something that ensures that you won’t have to worry about the replacement or reparation in your lifetime. The cost is a bit on the expensive side and goes as high as $28 per square foot, nonetheless, you can find some cheaper alternatives for as little as $14. Most importantly, a stone is durable and resistant to all forms of traffic. Even in a scenario where it does break (although this is highly unlikely), you can just replace those pavers that were broken instead of having to replace the entire surface. This, nonetheless, isn’t something that’s exclusive to stone but applies to all the pavers, instead. Another outstanding material that you should consider are the bricks that are used as pavers in order to create a unique patio layout pattern. Keep in mind that the difficulty of installation varies on the pattern you choose and that the price per square foot goes up to $20. The longevity of this particular solution is similar to that of stone, yet, it leaves a completely different aesthetic impression. The advantage of this particular material lies in the fact that it goes with contemporary, modern or minimalist homes, almost as well as it goes with a colonial style. In other words, it’s a universal solution to the question of which patio building material you should go with. Next, we need to discuss one of the most cost-effective and definitely the most popular construction material at the moment – the concrete. However, we have to split this discussion into two separate sections: concrete pavers and stamped concrete. Why? Well, simply because these two forms have different installation process, longevity, maintenance, price and they create a different visual impression. In other words, it’s more than logical to treat them as two separate materials. First, we’ll start with the more expensive option, the concrete pavers. Here, we don’t have to go into the specifics of installations and repair, seeing as how we’ve elaborately covered pavers in the previous two sections. Their lifespan is somewhat shorter than that of bricks and stone pavers (at about 50-100), however, they match their counterparts in almost everything else. The price per square foot goes between $13 and $20, which means that the choice of whether to go with brick or concrete pavers is a merely aesthetic one, whereas stone is still somewhat more expensive. As for the stamped concrete, this is a more frugal option of using concrete for your patio. The price goes as low as $6 and it can go as high as $13. 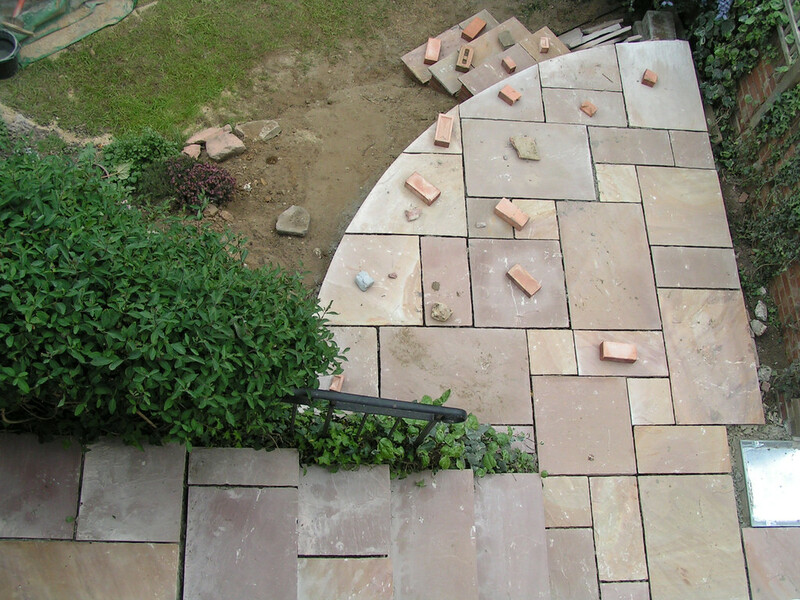 This is why most argue that it’s smarter to go with a high-end stamped concrete than low-end pavers. The greatest issue with the installation of stamped concrete lies in the fact that you need help from someone with adequate gear. On the other hand, nowadays, most homeowners go with specialized patio manufacturing companies like Interline Manufacturing making this into an even simpler choice. The only downside of stamped concrete is that it is supposed to last about 30 years, which, compared to the other entries on this list, doesn’t seem as much. At the end of the day, the most inexpensive option on this list is definitely gravel which ranges from $6 per square foot. When it comes to the lifespan, there’s really nothing to break here and from the standpoint of the installation difficulty, you really have nothing to worry about even if you never did anything even remotely similar in your lifetime. While some may see it as an easy way out, keep in mind that high-end pea gravel (about $10 per square foot) can be incredibly visually pleasing and go great with Victorian style homes and contemporary homes alike. At the very end of the day, with so many options to choose from, you get to customize your patio in whichever way you feel like. Just keep in mind that when you consider boosting a resale value, you need to make a choice that reflects well on the ROI. On the other hand, when boosting your own home, a personal impression is all that matters.